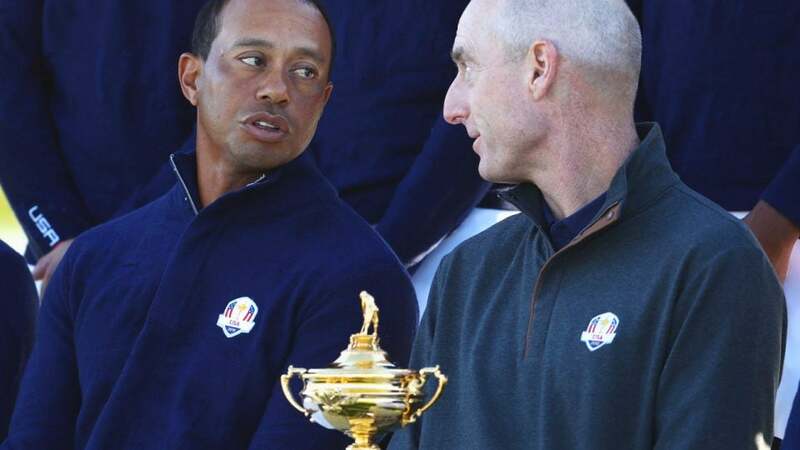 Tiger Woods and Jim Furyk at the 2018 Ryder Cup in France. Jim Furyk impressed everyone with his age-defying Sunday charge at TPC Sawgrass that almost won him a Players Championship. But that performance had another positive effect for Furyk: it vaulted him towards the top of the early 2020 Ryder Cup standings. There have only been two events so far with 2020 Ryder Cup points on the line, but if the contest ended today, the 48-year-old Furyk would be in second place and automatically qualify to play on the team. But his age isn’t the only thing unusual about Furyk’s position, after all Phil Mickelson played on the 2018 team at 48. The strange thing is that Furyk was the captain of that team. A former captain auto-qualifying for a Ryder Cup would truly be something else. Of course, the competition to make the U.S. team has only just begun, and there is plenty of golf to be played. Furyk certainly has a worthy resume. He’s played in a total of nine Ryder Cups on the U.S. side, in addition to being a non-playing captain of the 2018 squad. His most recent playing appearance was just five years ago at the 2014 event. The top 8 American players in the points-based Ryder Cup ranking on August 23, 2020 will automatically qualify for the team, then Furyk’s successor 2020 captain Steve Stricker will select four additional players to fill out the roster. In fact, Stricker picked Furyk to be one of his vice captains, so he’ll be in the U.S. team locker room whether or not he drops out of the Top 8. While Furyk is on the team as of now, one big name (more like the big name) is on the outside looking in: Tiger Woods. Woods currently sits in 10th place in the standings. But barring an injury, it’s hard to envision a 2020 U.S. team without Tiger on it. Tiger is taking his first shot at captain duties this fall at the Presidents Cup, where he hopes to be a playing captain. He was one of Furyk’s four captain’s picks for the 2018 Ryder Cup team that got smoked by Team Europe 17.5-11.5 at Le Golf National in France. Did Jim Furyk miss out on course record because he putted with the pin in? Sitting at the top of the 2020 Ryder Cup standings is someone who has a good chance of still being there a year and a half from now: Dustin Johnson. He got there via his win at the WGC-Mexico, the first qualifying event. You can check out the projected Top 20 in the standings below and the full projected points ranking here.